What makes your ideal escape? Beach fun in golden sunshine, getting close to nature on long countryside walks, or a spot of fishing in silent surroundings? At Cherry Tree it’s all yours. From the comfort of your own luxury lodge-style home, the famous sands of Great Yarmouth, and the quiet waterways and woodlands of the Broads are yours to explore. Just moments from your door they, along with the famous sights of East Anglia, offer unending new experiences. So just picture escaping to the coast whenever you choose. From long weekends with the family to month-long getaways for two – where you can discover what real relaxation means. Lazy late morning breakfasts, long strolls on the beach, the sound of birdsong… take time out to enjoy the simple things. The open skies, quiet waterways and vivid landscapes of the Broads National Park are minutes away. 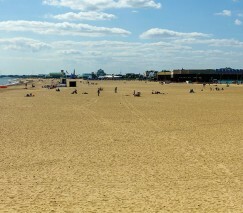 Unwind by the seaside – from the beautiful sands at Gorleston to the traditional charms of Great Yarmouth. Heated indoor and outdoor pools, an adventure playground, wildlife trails… Cherry Tree provides first-rate facilities. Feel at home. Your lodge features stylish furniture and fittings to help you relax from the second you arrive.